DESCRIPTION The patented Lumark Crosstour™ LED Wall Pack Series of luminaries provides an architectural style with super bright, energy efficient LEDs. The low-profile, rugged die-cast aluminum construction, universal back box, stainless steel hardware along with a sealed and gasketed optical compartment make the Crosstour impervious to contaminants. The Crosstour wall luminaire is ideal for wall/surface, inverted mount for façade/canopy illumination, post/bollard, site lighting, floodlight and low level pathway illumination including stairs. Typical applications include building entrances, multi-use facilities, apartment buildings, institutions, schools, stairways and loading docks test. Slim, low-profile LED design with rugged one-piece, die-cast aluminum hinged removable door and back box. Matching housing styles incorporate both a small and medium design. The small housing is available in 12W, 18W and 26W. The medium housing is available in the 38W model. Patented secure lock hinge feature allows for safe and easy tool-less electrical connections with the supplied push-in connectors. Back box includes three half-inch, NPT threaded conduit entry points. The universal back box supports both the small and medium forms and mounts to standard 3-1/2” to 4” round and octagonal, 4” square, single gang and masonry junction boxes. Key hole gasket allows for adaptation to junction box or wall. External fin design extracts heat from the fixture surface. Onepiece silicone gasket seals door and back box. 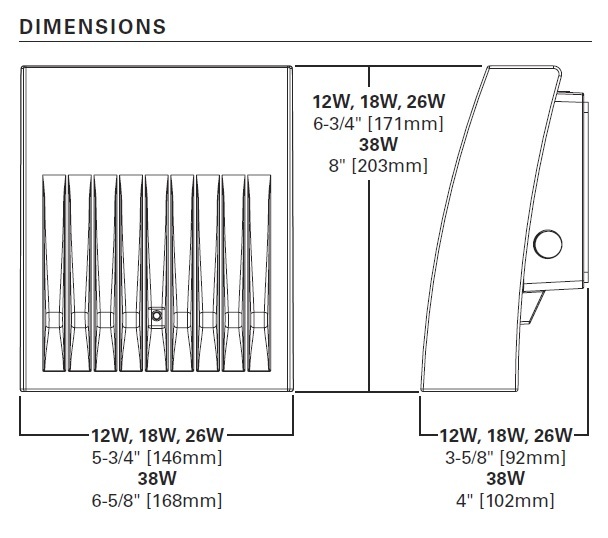 Minimum 5” wide pole for site lighting application. Not recommended for car wash applications. LED driver is mounted to the die-cast housing for optimal heat sinking. LED thermal management system incorporates both conduction and natural convection to transfer heat rapidly away from the LED source. 12W, 18W, 26W and 38W series operate in -40°C to 40°C [-40°F to 104°F]. High ambient 50°C models available. Crosstour luminaires maintain greater than 89% of initial light output after 72,000 hours of operation. Three half-inch NPT threaded conduit entry points allow for thru-branch wiring. Back box is an authorized electrical wiring compartment. Integral LED electronic driver incorporates surge protection. 120- 277V 50/60Hz or 347V 60Hz models. Crosstour is protected with a Super durable TGIC carbon bronze or summit white polyester powder coat paint. Super durable TGIC powder coat paint finishes withstand extreme climate conditions while providing optimal color and gloss retention of the installed life. Click the button below to add the LUMARK - Crosstour LED Wall Pack Series - 12W to 38W to your wish list.